A wet weekend with cautious to hazardous water conditions. Saturday and Sunday will have rain chances all weekend. Temperatures will be above normal in the 40’s to 60’s with lows in the 30’s to 40’s. Water conditions will be windy with high seas making cautious to hazardous water conditions. A weak low pressure system and warm front moves to our north overnight. A series of low pressure systems then track through the mid Atlantic states along an eastward moving cold front this weekend, which should all move offshore early Monday. High pressure in the Midwest and Great Lakes builds across New England Monday night into Tuesday, as weak low pressure tracks well to our south and east. High pressure builds to our south Wednesday, then a cold front moves through our area later Thursday into Friday. 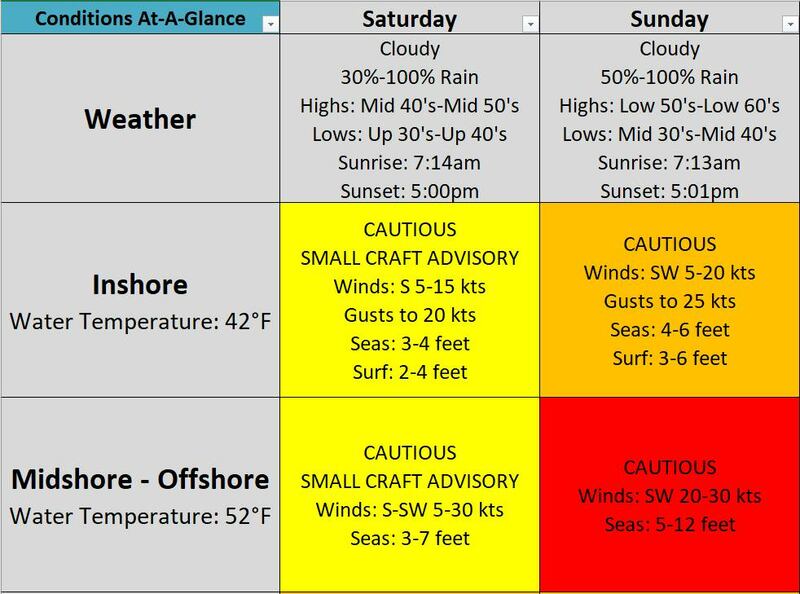 *****These forecasts are a general extended outlook for weather and water conditions over a large area, covering all of NJ and adjacent coastal waters to 50nm. Weather and water conditions can and do change frequently and can also be different for specific locations. Water conditions ratings are general guidelines only. Make sure to check the specific seas and winds for the area you will be traveling. Every boat and captain has different operating values. You should always check the most updated weather and water condition forecasts at NWS/NOAA and/or Buoy Weather or your trusted weather source before venturing out!